Over the weekend, I needed a break from working on grad school assignments. At the same time, Sarah needed a card sort on the vertex form of quadratic functions. Being the nice husband I am, I thought I’d help. Being the nerd that I am, I did it in LaTeX. This took a bit longer that I’d expected to create. I’ve a little experience creating graphs, so they weren’t too bad, but tables in LaTeX can be a little fiddly to get right. I also wouldn’t claim that took much thought went into choosing which functions to use. But, I’m pretty happy with the result. You can download the files here. Included is the shuffled set of cards (pictured above), the cards sorted into the correct order, and a zip file of the original .tex files in case you want to modify them at all. Edit (Oct 23): There were a couple of mistakes in the original version, it has been fixed now. 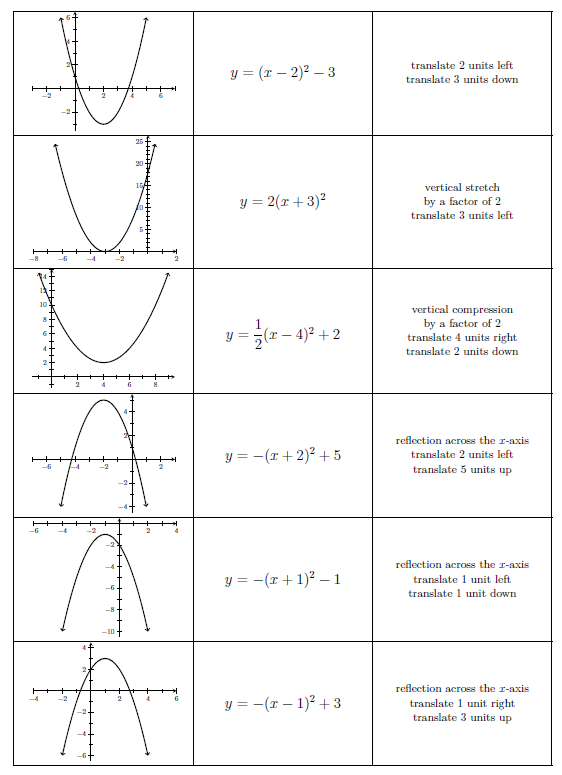 What I love about this is the way it demonstrates the differences between functions, expressions and equations, but also shows how there’s a connection between them too. This poster goes well with the set Sarah created about solutions, roots, zeros and x-intercepts; that’s how she’s got them in her room, after all! Now, the poster doesn’t capture all the particulars of these algebraic tools; it’s just a simple poster showing one example. There were some comments on twitter about the fact this poster doesn’t completely define what a function is, particularly absent a discussion of sets. Also, there was concern that the equation example implies all equations are homogeneous. Both criticisms have an element of truth, but also miss the point of a poster that, by its nature, only has one example. I think posters serve the best as either reminders of topics already discussed or starting points to launch a deeper discussion or investigation. Please, never put a poster on a wall and assume that means you’ve taught a topic. 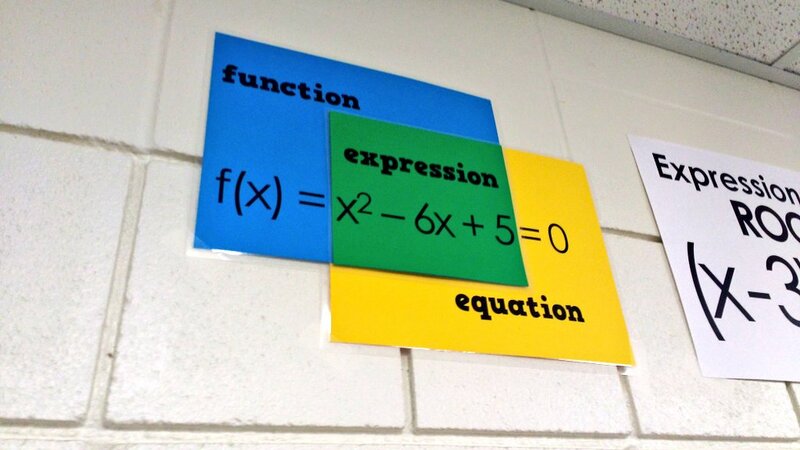 For an example of how I’ve discussed functions before, see these notes that I used in Algebra 2 last year. Choose your three colors. The effect works best (and helps communicate the idea) if the middle color appears to be a blend of the other two. If you don’t want to think too hard, just use blue-green-yellow like me, but I’d love to see other color combinations too. Print the first page (function) on the first color (blue, in my case), and the second page (equation) on the last color (yellow). Print either page on the middle color (green). For this page, you only need the expression rectangle, which appears on both pages. Cut off the rest of the paper. Stack your three pages with the expression rectangle of each page overlapping, with the middle color on top. Make sure you line up the rectangles as perfectly as you can. Continuing the theme of blogging I didn’t get around to last year, here are some diamond problems for INBs. If you haven’t heard of these before, the solution to these puzzles consist of four numbers. The top number is the product of the left and right numbers, and the bottom number is the sum of the left and right numbers. 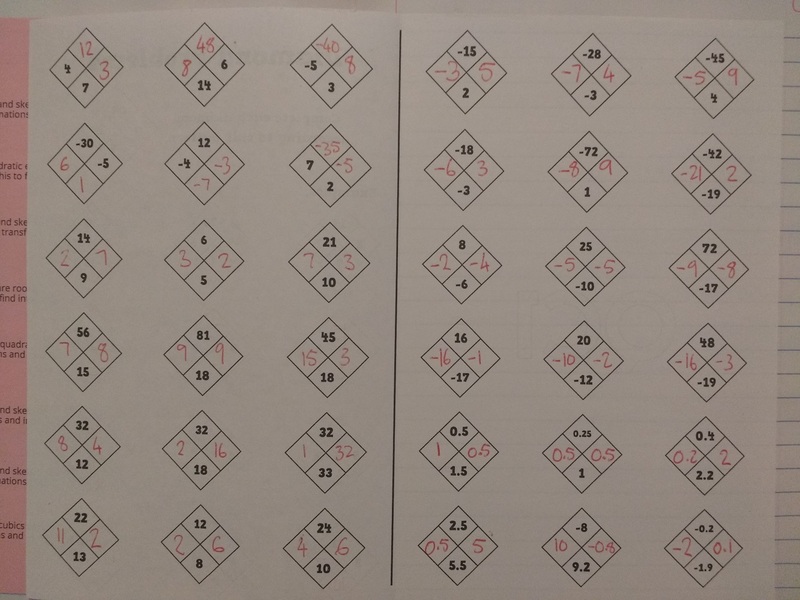 The puzzle consists of the diamond with two numbers filled in; the task is to determine the other two numbers. If the puzzle gives the left and right numbers, the solution is pretty simple. 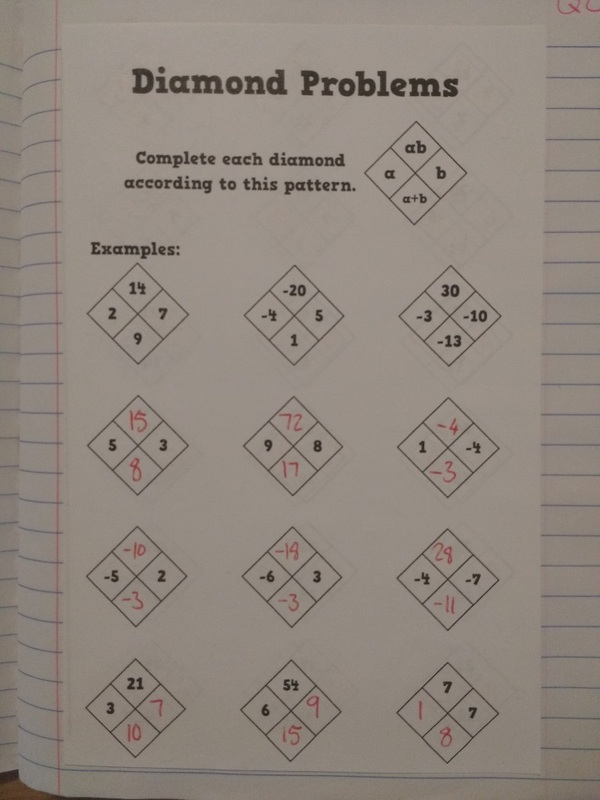 Even so, I provided some of these on the first page so students could understand the problem before moving on to the actual challenge: finding the left and right numbers when given the top and bottom. You may have noticed that the solutions to these puzzles are related to quadratics. For instance, the first example matches the factorization x2 + 9x + 14 = (x + 2)(x + 7). The magic of these puzzles is that they start teaching kids this vital skill for Algebra without it being obvious that’s what happening. If you’re teaching middle school or even upper elementary school, I really recommend giving your students these puzzles. You can change the difficulty as you need, introducing negatives when students are ready, and decimals or fractions when you really want to up the challenge. The puzzle is a logical thinking problem which is not too difficult to understand, and ties directly in a skill needed in Algebra. As it happens, I used these in Algebra 2, because that’s what I was teaching, but I wish I’d known to use these puzzles when I used to teach 7th grade. Your students’ future Algebra teachers will love you for it. Downloads are here, including blank versions for you to write in your own numbers. There’s also a last-five-minutes activity I used a few times related to this. Once students know how the puzzles work, have a student invent their own puzzle and write it on the board for the rest of the class to solve. I had some (very competitive) students who were very determined to give their classmates a problem they couldn’t solve, and others who were equally determined to solve these problems. These are the notes I wrote for adding and subtracting rational expressions last year in Algebra 2. 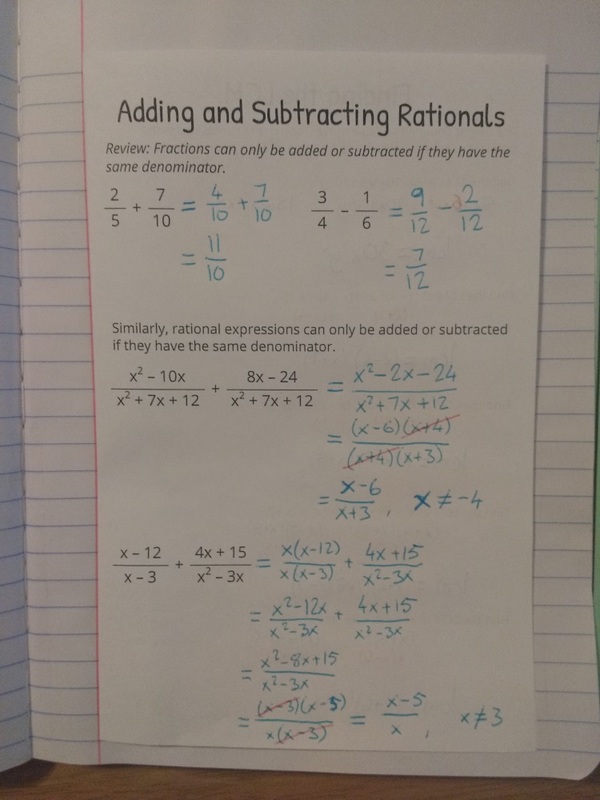 On the first page, I wanted to make the connection between rational expressions and fractions explicit, so I started with a reminder of how to add and subtract fractions. The two examples were chosen deliberately; the first only required changing the denominator on one fraction, while the other required changing both denominators. 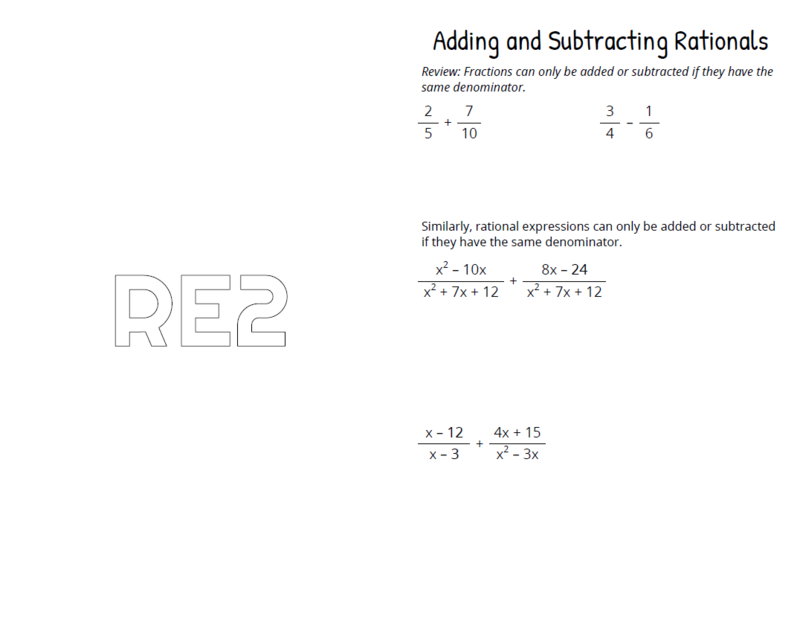 Students need to deal with both types of problems with rational expressions. 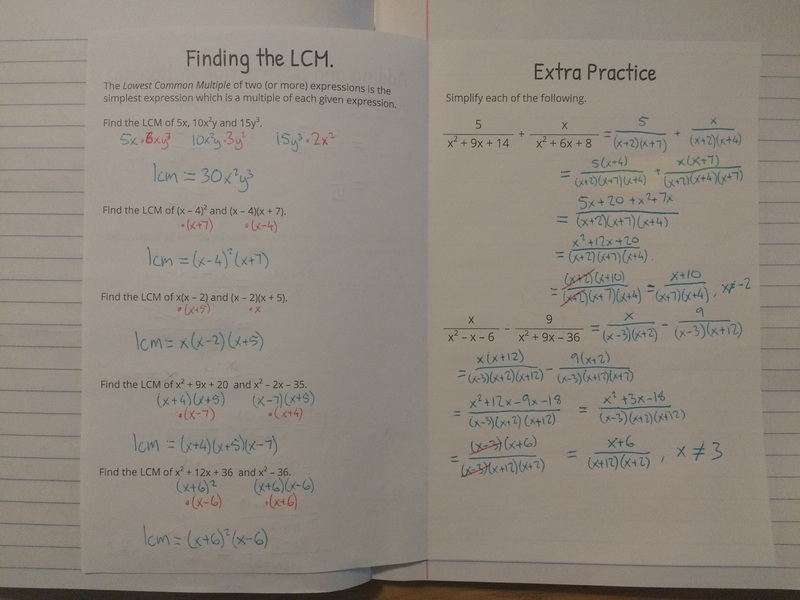 The next page was about finding the lowest common multiple. 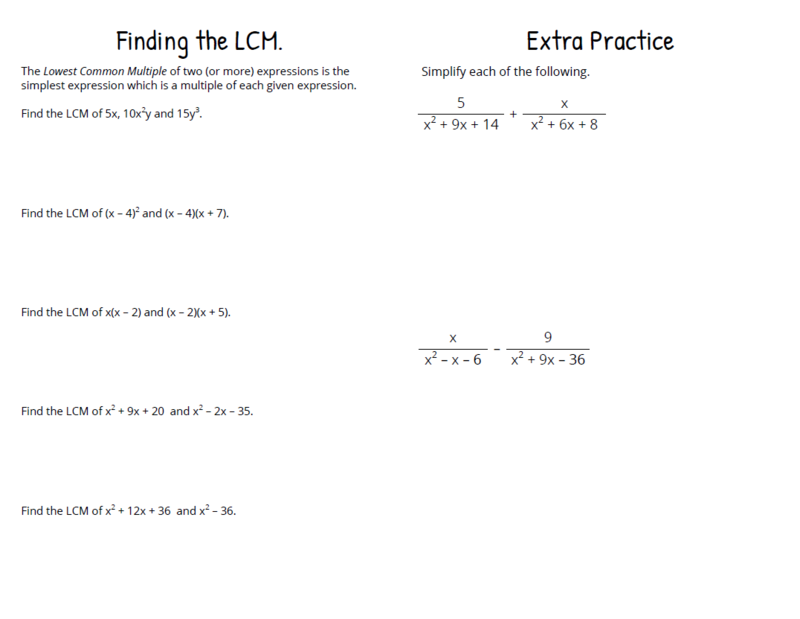 I had students use a strategy which emphasizes the definition of the LCM, having them multiply by factors so that the two expressions are the same. And finally, a couple of examples putting all of this together. Which “range” are we talking about? I’m becoming a student again this fall. As I’m preparing for that, I’ve been reading through some of the textbooks for the classes I’m taking (particularly Topology, affiliate link), which has got me thinking about how we use the word “range”. I’m talking about the range in the context of functions. The fact that I’m even having to clarify that I’m not talking about statistics, or an interval of integers, or the multitude of uses the word has outside of math, highlights just how ambiguous the word already is, without mentioning the ambiguity just within the context of functions! The correct answer to this question is… well, there isn’t one. It is a (deliberately) bad question because the meaning of “range” is unclear. The question I was really asking was “Does the word ‘range’ refer to the image, or to the codomain, of a function?” And while most said that it refers to the image (which is what I would’ve said, prior to thinking about this), 15% chose the codomain. The problem is illustrated really well by this image from Wikipedia. The is domain is red, the codomain is blue, and image is yellow. But the range is either yellow or blue, depending on context. According to my poll, and the limited research of high school standards I’ve done, most would say yellow. But definitely not all agree with that. Analysts are apt to use the word “range” to denote what we have called the “image set” of f. They avoid giving [the other set] a name. Maybe the 20 people who all voted for ℝ were all topologists? Probably not. But, it shows that different people have different assumptions about what the range of a function means. With all of this confusion around the meaning of the word, how are high school students supposed to understand what the range is? One solution would be to get rid of the word altogether. The words image and codomain already describe the two sets without any ambiguity, so we can just use those instead, right? We just need to define the two terms clearly, and the confusion in our classrooms will be significantly reduced. Alas, students are still going to come across the range, whether that’s in a textbook, on a standardized test, or in their next class with another teacher. But there’s somewhere else we can turn for guidance. I’m a strong believer in the idea that whatever academic standards apply to your jurisdiction, you should follow them, regardless of your opinion of those standards. So if your standards use the word range, your class should too. I took a look at a few different standards to examine how they suggest the terminology of functions should be used. Common Core is a bit of a disappointment here. The glossary does not define range, domain or even function. The standard CCSS.Math.Content.HSF.IF.A.1 states that a function “assigns to each element of the domain exactly one element of the range.” Which is an accurate description of a function, but it’s unclear if the range here refers to the image or the codomain. Oklahoma (where I’ve taught most recently) defines the range in the context of relations, rather than functions: “The set of all the second elements or y-coordinates of a relation is called the range.” Now, this is not how I would’ve written this definition, but it is something we can work with. By this definition, the only values in the range are those that have a matching value in the domain, meaning the range is identical to image. If I were teaching high school classes again this year, I would teach the range as I have previously, but I’d also take the time to define the codomain as well. The Australian Curriculum gives a nice, clear definition of the range, which matches the image, as well as defining the codomain, in the glossary for Mathematical Methods, under the heading “Function”. I don’t remember teaching the codomain explicitly when I last taught in Australia. Perhaps I should have. Regardless of where you are, I’d argue that it’s important to define the range very clearly, according to your location’s standards. But also define codomain or image, depending on how range is defined. The point I’m trying to make is this: As math teachers, we need to constantly examine the terminology we introduce to our students. Because sometimes we might not be being as precise as we could be. If you want your students to be really clear on the meaning of mathematical terms, make sure you are first.